Earlston Civic Week's scarecrows go on tour. 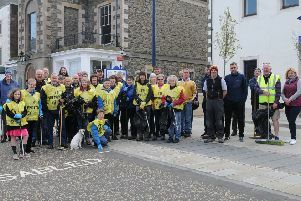 This year’s Earlston Civic Week has gone down as one of the best ever, thanks to glorious sunshine and its ever-changing programme of events. For the first time in as long as organisers can remember the sun shone on every single event of the annual festival, helping pull in bumper crowds. Earlston residents got to work decorating the town with over 100 scarecrows. “It was an enormous success, very much assisted by the weather,” Tom Burnham secretary of the event’s organising committee, said. Throughout the week townsfolk enjoyed pool, dominoes, darts, bowling and football tournaments as well a treasure hunt, bingo, a pet show and disco. Tuesday’s White Hill race was won by Ewan Christie and Jessica Hendry while first man and woman home in the Black Hill race were Alistair McDonald and Louise Mitchell. The week culminated with Friday night’s concert in the marquee, where 150 revellers enjoyed entertainment from Scocha, and Saturday’s fancy dress, sports, torchlight parade and fireworks. Tom added: “Scocha were a phenomenal success, they never let us down. It’s the fourth time we have had them and they are as popular as ever. “The fancy dress was it’s normal successful shape and size. “The innovation there was the fire brigade joined the procession as far as the rugby club where it stopped and squirted all the kids with water, which was great fun. “We had perfect weather for that afternoon’s sports, too. We had every conceivable manner of sports from wheelbarrow races to egg and spoon. We really went to town and kept going until everybody was exhausted. Other changes this year included the moving of the pet show from the Tuesday to the Monday, and the return of a duck race for the first time in around six years. Tom puts the success of these new events and changes down to the week’s innovative organising committee. “We have a big committee over over 20 members, with a lot of young people on it,” he added.